Graphite shafts come in all sorts of lengths and flexes. All graphite shafts are made from layers of carbon fiber. That's where the similarity ends: Graphite shafts differ in weight, length, flexibility, and other factors such as torque. Although graphite is generally softer than steel, technological advances have allowed golf designers to make graphite shafts in every flex, including extra-stiff. The differences in graphite shafts should enable you to find one that fits you to a tee. The large number of choices, however, makes it hard to sort through the different possibilities. A good club fitter can help you find the best graphite shaft for you. 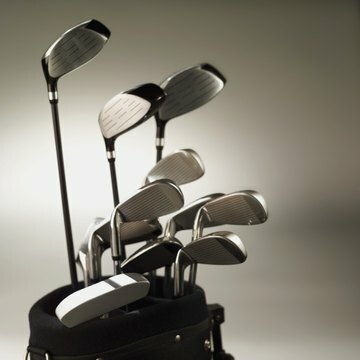 Graphite comes in all five standard flexes, ladies, seniors, regular, stiff and extra-stiff -- or "x-stiff." A ladies flex bends more than any of the others. It's geared toward golfers -- male and female -- who have swing speeds under 60 mph and need the extra whip of the shaft to increase the distance they hit the ball. Professional golfers who swing 100 mph usually choose stiff or x-stiff shafts. Such shafts are much more rigid and give the best players a more controllable club. The commonly used standard for clubs lengths for graphite drivers has been around 45 inches. As of 2012, however, many golfers are using graphite drivers as long as 48 inches -- the longest legal length. In theory, the longer length, coupled with the lighter weight of graphite shafts, should yield more distance. Many experts, however, believe the longer shafts are a losing proposition. The increase in distance will be minimal, though, while your loss of control could be severe. Bubba Watson, one of the longest hitters on the PGA Tour, suggests most golfers should try shorter rather than longer shafts if they want to hit the ball farther. Each graphite shaft has a kickpoint, or flex pont -- the spot on the shaft that bends the most. A low kickpoint makes it easier for golfers to get the ball in the air and produce shots with higher trajectories. A high kickpoint is preferred by talented golfers who want to hit lower shots that bore through the air. With so many different types of graphite shafts to choose from, it takes a skilled club fitter to find the one that bests suit your game. As "Golf Magazine" states, "Choosing the right shaft is crucial to lowering your scores as well as giving you the feel and control you desire." An experienced club fitter will help you test a variety of graphite shafts to find the one that will produce your optimal performance.